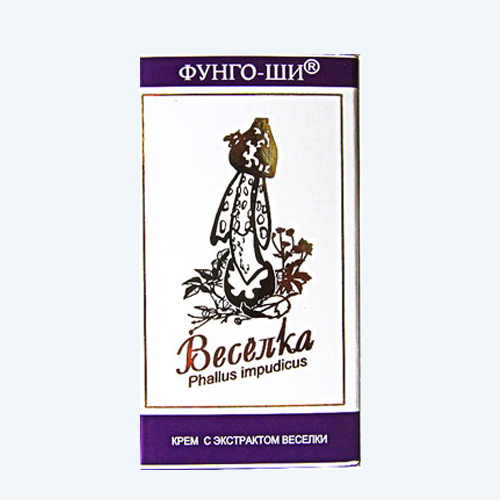 The curative effect of ordinary locks (Phallus impudicus) has been known since ancient times - it was treated (external application), various joint and skin diseases, difficult to heal wounds, various ulcers, furunculosis, thrombophlebitis, varicosity, etc. Indeed, scientific research has confirmed this - in Veselka vulgaris (Phallus impudicus) a lot of substances have been discovered that have a clear therapeutic effect, for example, polysaccharides possessing antitumor effect, alkaloids being a natural analgesic, natural antihistamines, that is substances that remove allergic reactions, and that especially important - substances that suppress dermatomycosis, that is, skin fungal infections. Composition: water, olive oil, stearic acid, emulsion wax, common vesicle extract, methylparaben, aromatic perfume, propylparaben, vitamin E.
1. Articular diseases (arthrosis, arthritis, polyarthritis, psoriatic arthritis, osteochondrosis, gout, sciatica), in oncology with metastasis in bone tissue. Application: light massage movements rub a small amount of 2 cream a day in the skin, it is advisable to apply a warming bandage (except for oncology). 2. Healing wounds and ulcers (thrombophlebitis, cancer, fistulas, decubitus, chiri, furuncles). Application: apply a thin layer of the cream on the ulcer, then the gauze swab and fix the bandage with a tubular or medical bandage. Change the bandage once a day. 3. Skin diseases (dermatitis, mycosis, pyoderma, psoriasis, eczema, fungal diseases of feet and nail lesions). Application: apply a thin layer of cream on the hearth, then cover with a gauze swab and fix the bandage with a tubular or medical bandage. Change the bandage 2 times a day. 4. Varicose veins disease, varicose veins, thrombophlebitis. Application: light massage movements rub a small amount of 2 cream into the skin a day without applying warming dressings. 5. Benign formations on the skin (papillomas, lipomas, warts). Application: light massage movements rub into the skin a small amount of cream 2 once a day. Cream "Fungo-Shi Veselka" certified, safe and effective. Contraindications: individual intolerance to the components of the cream. There were no side effects. Storage conditions: store at room temperature, dry, protected from light. Shelf life 12 months from the date of manufacture. The date of manufacture, see the packaging.